This solid wood Magic Set includes ten amazing and easy-to-learn tricks for the beginner. You'll learn tricks such as Magic Number Prediction, Disappearing Ball, Secret Silks, Money Maker, Egyptian Prediction, and much more! 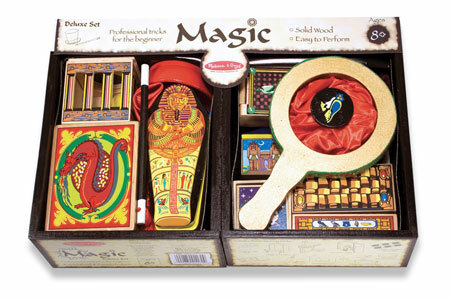 Each deluxe magic set includes a sturdy wooden storage box that nicely holds all the tricks. Great for people ages 8 to 80. Cyber Monday Special: $23.60 - Save 20%!